It’s here! My new book, which I’m really excited to share with you! 2015 is starting with a bang and this is an opportunity to start the year with very structured guidelines or a “game plan” as you will of how to prepare yourself for the job hunting in this field. This book is an amalgamation of advice I have given in my weekly newsletter, weekly articles, blog posts and more since I have started the project “Doing what you love”, that culminated in the book with the same title. 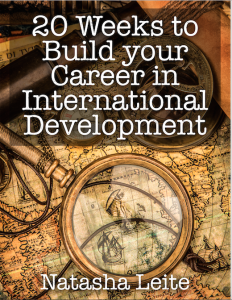 It was build in a way that in 20 weeks you are able to find pertinent information on a career in international development as well as practical advice of what to do and what not to do while looking for a job. It was a great experience and I hope that you find it really useful and helpful in your search. Best of luck in your job hunting! Next story How to perform well at interviews being an introvert? Previous story How to deal with failure?